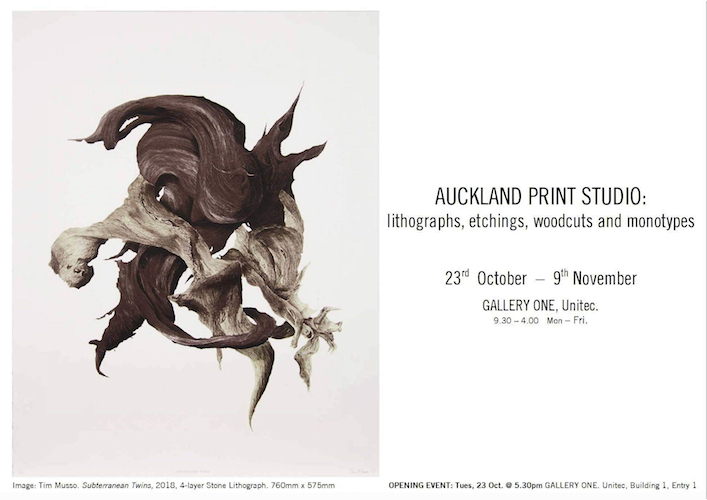 Auckland Print Studio’s 10th Anniversary Exhibition featuring lithographs, etchings, woodcuts and monotypes opens at GALLERY ONE, Unitec 5:30pm Tuesday, 23 October. Pop along to view works by Solander Gallery artists John Pusateri, Jacqui Colley, Michael Barnes plus a selection of artists we have previously exhibited including Jude Rae, Lonnie Huthinson, Sandow Birk, John McKaig, Tim Musso, Dan Heskamp, Jason Grieg, Zuza Kosinka, Aiko Robinson, Trevor Parker and Stephen Ellis. Exhibition runs until 9 November.